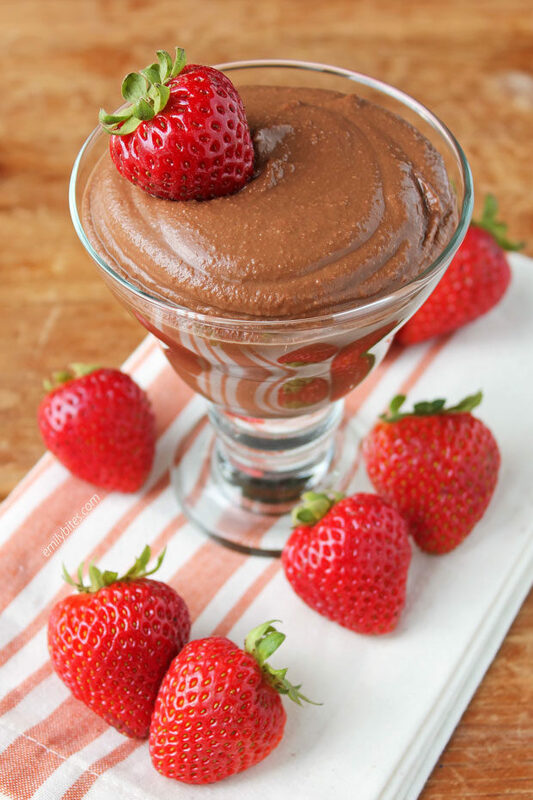 I am positively swooning over this smooth, rich, perfectly sweet, and easy chocolate hummus. You’re probably used to savory hummus flavors like my Ranch Hummus or Buffalo Wing Hummus, but if you’ve never tried a sweet variety, get ready to fall in love! This simple chocolate hummus uses only 6 ingredients and comes together in less than 5 minutes (including measuring out the ingredients) – what’s easier than that? I can’t get over how decadent and chocolatey this tastes, and it’s perfect as a dessert, a snack or as party food (make this to be a potluck hero). Plus, a generous ¼ cup (which just means a serving is a little more than ¼ cup) is only 127 calories or 3 Weight Watchers Freestyle SmartPoints! I love serving this with fruits like strawberries, pineapple spears, or banana slices, but it would also be great with something salty like pretzels. 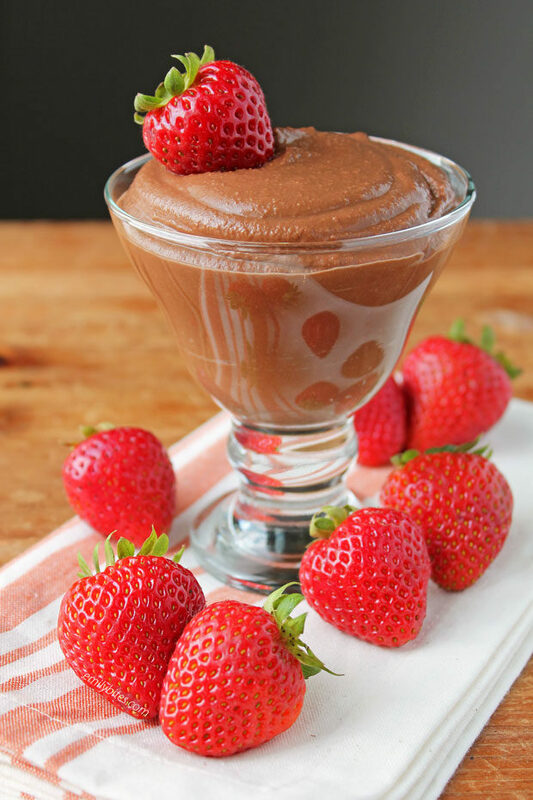 The Greek yogurt gives this chocolate hummus a smooth and creamy consistency that’s perfect for dipping! Looking for more tasty, lightened up dip recipes? Check out my Buffalo Chicken Dip, Ranch Hummus, Pepperoni Pizza Dip, Cannoli Dip, Chili Cheese Dip, BLT Dip, Greek Layer Dip, Creamy Dill Dip, Spinach and Artichoke Dip, Hot and Cheesy Bean Dip, Caprese Dip, Chocolate Fruit Dip and more in the appetizers section of my recipe index! Place all the ingredients in your food processor and turn it on. Process for about 2 minutes or until smooth. You may want to stop it halfway through and scrape the sides of the processor bowl down with a spatula just to make sure everything gets processed smoothly. Refrigerate leftovers. Looks so good! How long would this last in the fridge? Made and loved for snacks last week. Subbed some maple syrup as I ran out of honey. Delicious! Oh, wow! I cannot wait to try this! Thank you for posting! Of you make this with Splenda would it have 0 points? I LOVE this recipe!!! My husband, 8, 5, and 2-year-olds love it too! I decided to experiment tonight, and I added about 1 teaspoon of hazelnut extract. It’s not quite Nutella, but it’s still good! I’m also thinking maybe next time some peppermint extract for mint-chocolate??? I feel like the possibilities are endless! Would it work without the honey or is there another way to get the points down? Hi – I’ve been making a version of this for months now – and have gotten the WW points down by reducing the sweetener to 1 tablespoon (I use maple syrup, as it’s got the most bang for it’s buck “flavor-wise” to me. Dark Agave would work well too. And I add a 1/2 teaspoon ground stevia (I buy the whole dried leaves, and grind to a powder – but – you could use an other powdered version of stevia, or a few drops of the liquid – I just wanted to use something with no additives at all). – I also add a half of a banana. – That makes it plenty sweet enough for me – and gets the points down to 2 for a 1/4 cup. — I also don’t use the yogurt (my initial recipe just didn’t call for it) I use 2 tablespoons of tahini (yes – it’s points, but it’s also nutrition, and adds a rich flavor and texture) – I use black beans rather than chickpeas (they come out smoother) – add 1 tsp. of vanilla – and usually also add ground cinnamon and New Mexican red chile pepper. (so it tastes a lot like Mexican hot chocolate). – It’s really good, and everyone I’ve served it to loves it.